Football - Challenge Cup semi-final, Shelf FC (blue) v Sowerby Bridge. Rory Senior for Shelf and Lee Wood for Sowerby Bridge. Sowerby Bridge and Hebden Royd Red Star will contest this season’s Skircoat Green Physiotherapy Challenge Cup final. They had contrasting victories over the two Shelf clubs in the weekend’s semi-finals, contested earlier than usual due to the run of fine Saturdays. Bridge, beaten in last year’s final by Greetland, showed their determination to go one better by handing out a 5-2 hiding to champions Shelf FC at Natty Lane, Illingworth. Hebden Royd Red Star produced a battling backs-to-the-wall effort against Shelf United, a late Lewis Cockroft penalty giving them a 2-1 success over Shelf United at Shroggs Park. Damo Watkins hit a hat-trick as Bridge demolished Shelf FC with a stunning team display from the first minute to the last. Tom Hiley set Bridge on their way after 10 minutes, expertly heading home a brilliant right wing cross from brother Sam. Watkins doubled the lead shortly after. Good build-up play from Joel Cleary and Martyn Bates released Sam Hiley and his centre was forced home at the second attempt by Watkins following a good save from Shelf keeper Pawel Szypulski. Bridge scored a crucial third just before half time, Tom Hiley’s corner was headed towards goal by Andrew Markham and Watkins was on hand again to tap home. Shelf had a great chance to pull one back before the break but Alex O’Keefe could not convert after rounding the goalkeeper. Bridge made it 4-0 on the hour when the outstanding Adam Barlow won a free-kick in midfield and Ryan Brook’s inviting cross was brilliantly headed home by captain Lee Wood. 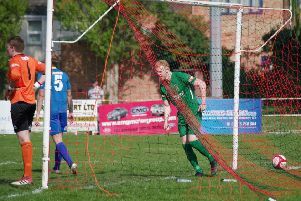 Shelf were thrown a lifeline when a penalty was awarded and Matthew Hartley sent Jordan Bolton in the Bridge goal the wrong way. Shelf kept pushing and with 10 minutes remaining reduced the arrears even further as Johnathan Aaron prodded home after a goalmouth scramble. However, Bridge managed the game well in the closing stages and substitute Ben Hiley’s pass found Watkins and he hit a rocket into the bottom corner from the edge of the box to put the icing on Bridge’s cake. Star, as expected, found Shelf United a different proposition than when they beat them 5-0 early in the season. United felt they had more than enough chances to have gone through. David Chappell, Billy Grogan and Harry Talbot missed opportunities as Star made a slow start and struggled to impose themselves. It was 0-0 at half time and Shelf were particularly dominant after the break but had nothing to show for their efforts. Star took the lead around the hour mark following a corner when an effort on goal went in via Cockroft’s head. Play was scrappy after that but Chappell found an equaliser with six minutes left and Shelf had chances to win it before Marco Romano fouled Will Chadwick in the closing seconds and Cockroft settled matters.